July 1: I woke up to rain, which pretty much continued all day. The rain would occasionally break, lifting your spirits, teasing you into believing it might stop for good, but no, a few minutes later it would resume and crush your spirits again. 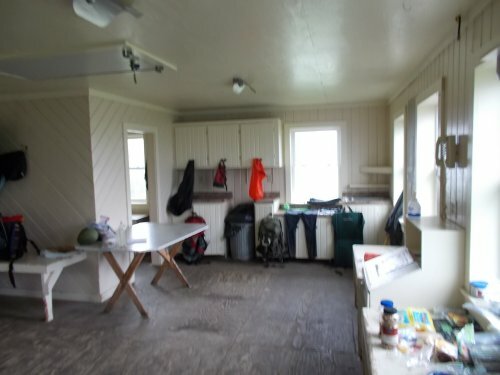 Inside the Spruce Peak Shelter. The mysterious pain in the bottom of my left foot had stopped during the night, but then I wasn't hiking either. In the morning, I put on my shoes and took a few steps around but felt nothing and hoped that meant whatever was causing the problem finally went away. 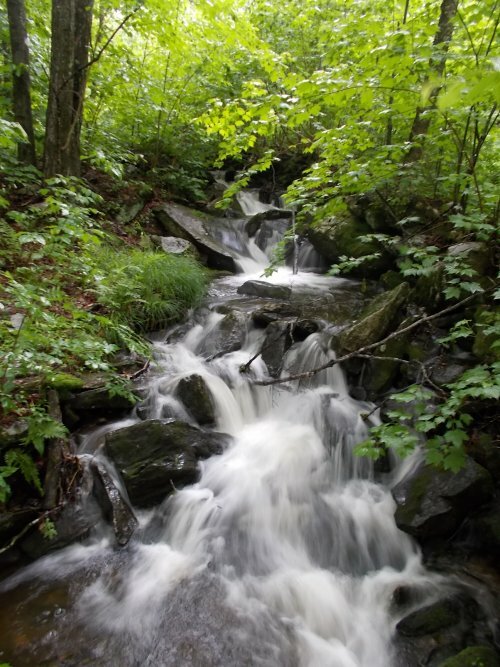 But about five minutes into the day's hike, I felt that sharp stabbing pain again. What the hell?! But again, I could find no reason for it. I hobbled along, though, trying not to apply pressure to the middle of my foot. It was tempting to stay the night. 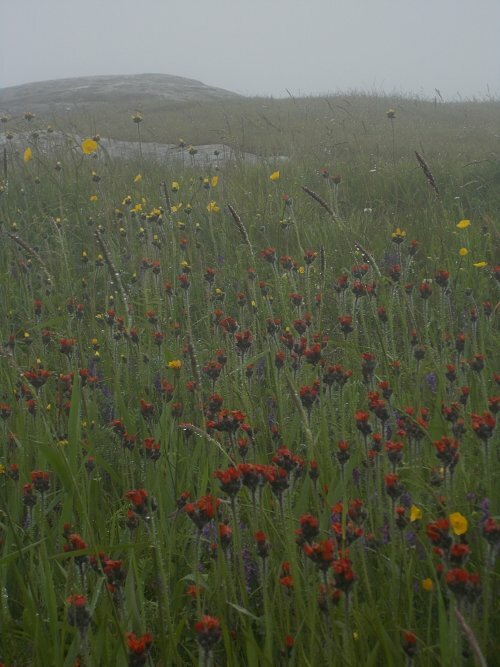 Although I had only covered six miles, the place was dry and, on a clear day, provides wonderful views. It wasn't even noon, however, and I knew I'd get itchy to stop so early in the day. No, I'd continue on. While at the shelter, I took off my shoes and once again took a good look at the left one, trying to find any reason why it would be causing that sharp pain in my foot, and that was when I noticed a tiny glint in the tread of my shoe. It wasn't much, but it definitely wasn't supposed to be there. It could have easily been covered with mud which is why I never noticed it before. Feeling around the inside of the shoe, I didn't feel anything off, but I took out the insert from the shoe and then when I felt around, I found it.... a small finishing nail. #@$%! * I'd been hiking the last 15 miles with a damn nail in my shoe! It came up through the shoe just enough so the tip was just below the surface of my insert, and whenever I stepped hard on it, it was just enough to compress the insert to poke the nail out and stab me in the foot. While I was glad to finally figure out the mystery of the stabbing pain in my foot, I was more than a little annoyed at myself that it took me 15 miles of painful walking to figure that out. The nail was wedged tightly into the shoe and it took me about five minutes to finally wiggle it loose. 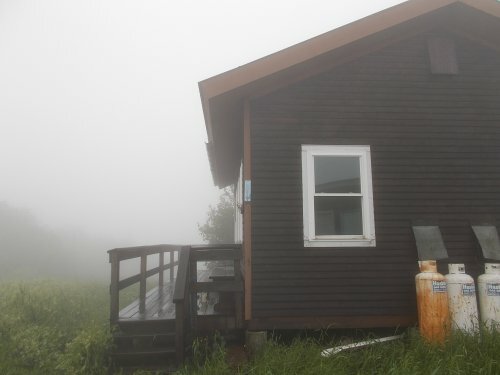 I stayed in the ski hut for a couple of hours relaxing and chatting with the other hikers, not anxious to go back out into the rain, but eventually, I had to continue onward. I just couldn't stop this early. I didn't mind stopping early on a miserable day like this, but six miles.... Nope, I couldn't stop that early! 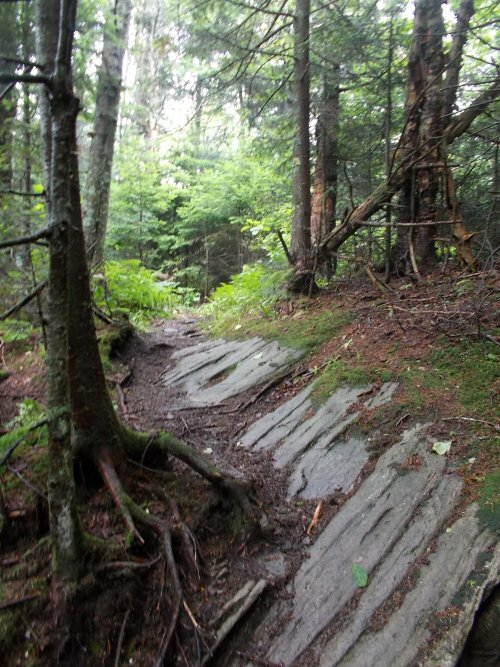 I finished the day at the Peru Peak Shelter, completing a short 12.9-mile day of hiking. It was a short day, but not a total loss either! 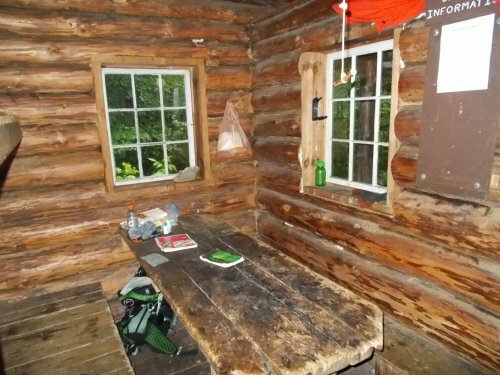 The shelter included four people: a group of three Long Trail thru-hikers heading northbound, none of whom had any trailnames yet. 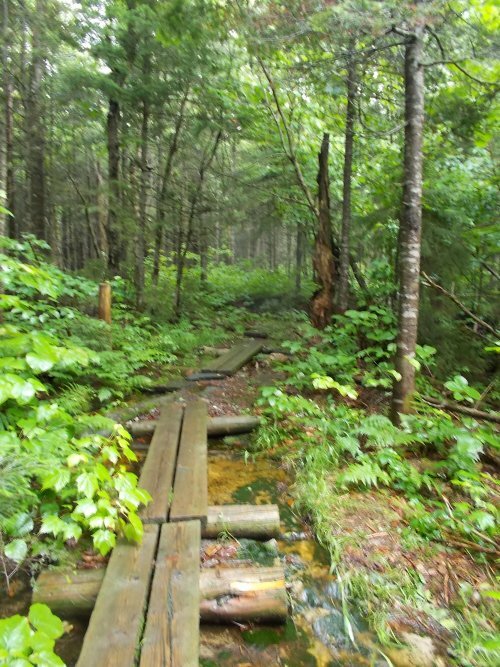 And then there was Bearfish, an AT flip-flopper who started hiking in Virginia and, after finishing at Katahdin, would go back and finish the southern part of the trail. 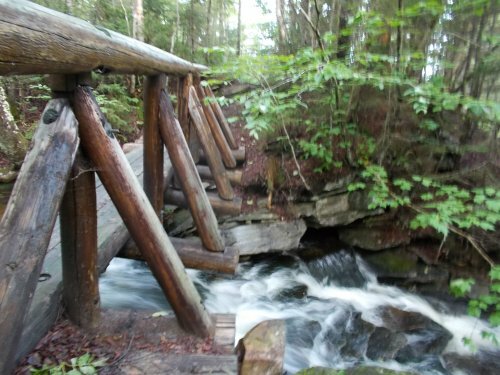 He's an older gentleman who'd dreamed of thru-hiking the trail for years and by golly, this was the year it was going to happen. It was the first time I met him, and while I didn't know it then, I'd be seeing a lot more of him. The highlight of the evening was when one of the three Long Trail thru-hikers went to brush his teeth and immediately spit it out, gagging. Apparently, he had put his toothpaste and sunscreen in similar-looking containers and accidentally used the sunscreen on his toothbrush. Yep, he was brushing his teeth with sunscreen! With the rest of us in the shelter cracking up, he continued trying to get the sunscreen out of his mouth by spitting and rinsing his mouth. After the matter settled down, I pointed out that a lot of trailnames are created because of amusing anecdotes like that one. One of the friends said, "Yes! You should be Sunscreen!" And the guy who had brushed his teeth with sunscreen immediately agreed. "Deal!" After it got dark, everyone went to sleep. I read a bit on my Kindle then followed suit. 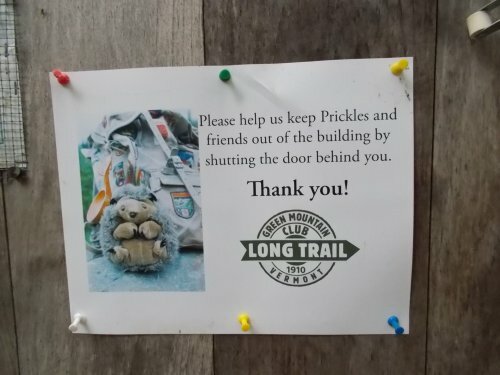 Porcupines like to get into the privies to eat the wood, so they put up this sign to ask hikers to keep the door closed! The trail passed through the Bromley Ski Area. 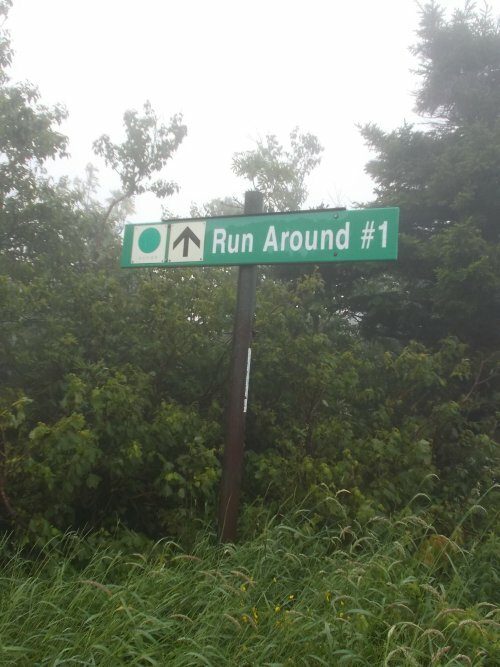 All the hikers already knew we were getting the run around, but it seems kind of rude to taunt us with the fact with signage! 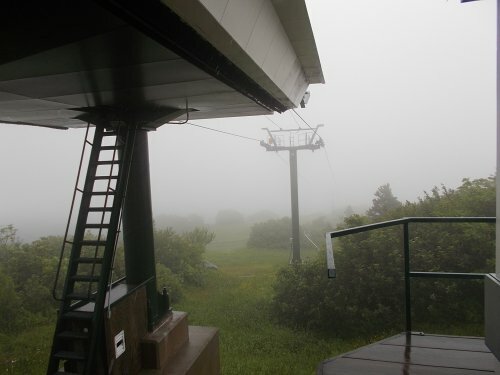 The weather was dreadful all day! Inside the ski hut. The water and electricity didn't work, but that phone on the right wall DID work! On a clear day, the views are wonderful! 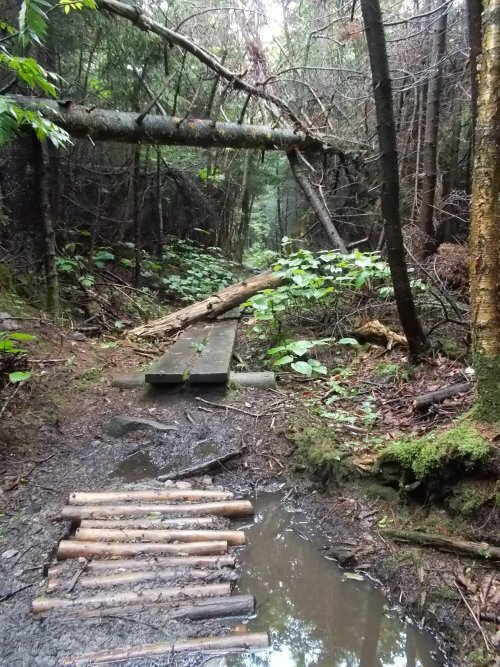 Looks like the trail could use a little work! No pictures of the nail?? Wow is my face red!!!!! !